Prior to Panda/Farmer ref 12 (February 23, 2011) Google’s reputation was being undermined by spam! To date there are 935,999,0100 websites on the net – this number is increasing every second. This begs the question what does Panda deem high quality within content? Our most comprehensive answer to this question is in itself a list of questions posed by Amit Singhal a Google Employee, who wrote down in his blog post ‘More guidance on building high-quality sites’. 1. Is it a GOOD ANSWER to the query? Does it answer the query? In order to do this it is generally agreed that the word count shouldn’t drop below the 600 words as hinted at by Matt Cutts There is compelling evidence that there is correlation between longer copy and higher rankings SerpIQ. Who’s the Author? A good writer is followed and shared by other professionals within the same field. Google knows the main guru’s in any given field. The closer the writers relationship is to these people the higher their deemed value by Panda. 2. Has it got STRUCTURE? In an excellent post by Rand Fishkin he divides content into three distinct content types. Discovery phase content – Content is created to build awareness of your brand. This is designed to stand alone as advocate content for the brand. 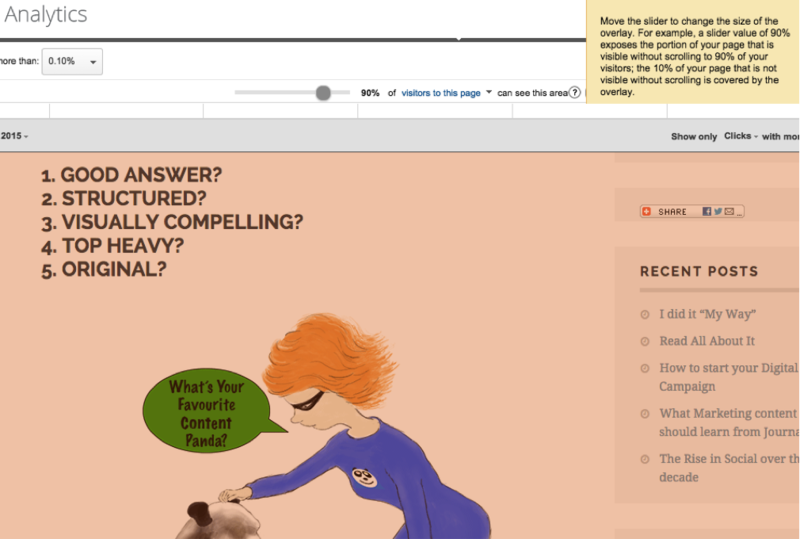 In addition, interesting well researched ‘discovery content’ will assist the main content in its objectives. Viral content – This is content that is so interesting in its own right that people just have to share it! It’s purpose its to still broaden your brand footprint to potentially attract social influencers. Does your content have useful ‘supplemental content’? There should be a clear distinction (emphasized by the design) between main content and supplemental content. Does your content look professional? Josh recommends that you should: Include Company Address and/ or Contact Details on every page. A Mission Statement in your About Us page. Link OUT always link out to primary sources. This again demonstrates to Panda that you have done your research and are professional enough to recognise the experts who have informed this research. No over using of a KeyWord Phrase – both within the body text and within Internal Links. Does it keep on Message? Just adding unrelated content for the sake of it will now count as a low quality indicator. Only Quality Content will do! 3. Is it VISUALLY COMPELLING? Quality sites invest time and money in designing pages with visual elements that support the text. 4. Are your pages TOP HEAVY? Panda measures the originality of you images. If you have invested in original art work you will gain quality brownie points from the algorithm. Don’t assume that because you’ve brought the copy write and changed the filename you are now displaying a unique visual. Michael Cottam explains in his article that Google can detect duplicates of images irrespective of filename.